Sometimes too complex. While I adore the ambition of “Fringe,” some of the episodes are a bit heavy on the exposition and a bit light on the subtlety. I wish the show was allowed to breathe every once in awhile and not always be so focused on explaining/advancing the mythology. The actors are certainly up to the challenge of deeper characterizations, especially John Noble, who was absolutely deserving of an Emmy nomination. Maybe next year. And that’s perhaps the most amazing thing about “Fringe” — that there is a NEXT year. “Fringe” was renewed by FOX right after it hit series-low ratings, but the show is redefining what can be called a hit. Kudos to FOX for looking at the big picture, including DVR, iTunes, Blu-ray, and other delivery options for television. It’s a brave new world for TV in which traditional ratings don’t mean nearly as much as they used to. “Fringe” could be the example for the future — a Friday night series that hardly anyone watches in its initial airings but can still be called a hit. I hope it’s on for years to come. One of the reasons for that hope is the very-impressive Blu-ray releases from Warner Bros. Not only is this easily one of the best HD transfers for a TV Blu-ray this year but the release is packed with special features. “Fringe” has loyal, devoted fans — the kind of people who buy Blu-rays. A show like “Two and a Half Men” may have significantly higher traditional ratings but “Fringe” fans are the type more likely to dive deep into their favorite series on Blu-ray. It’s fantastic to see that kind of devotion rewarded with a release like “Fringe: The Complete Third Season,” one of the best TV on Blu-ray releases of 2011. Immerse yourself into the dual universes in mind-blowing hi-def! The mystery of the universes deepens in the critically acclaimed 22-episode third season of television’s most exciting sci-fi. The Fringe team escapes from the parallel universe - except for Olivia, trapped in the other world and replaced in ours by her double, who turns Peter and Olivia’s tentative relationship into a love affair. Then Olivia returns, bonds of trust fray, ever more bizarre and terrifying phenomena occur and secrets that stretch back to 1985 threaten to destroy our universe. Or theirs. “Fringe continues its hot streak known as Season 3. It’s been firing on all cylinders all season.” (Andrew Hanson, LATimes.com). 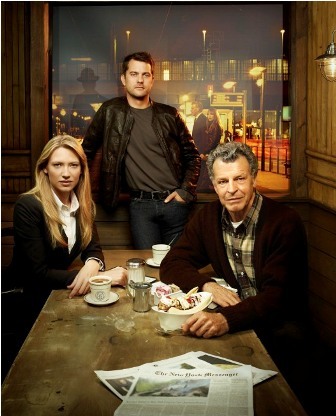 “Fringe: The Complete Third Season” stars Anna Torv, Joshua Jackson, Lance Reddick, Blair Brown, and John Noble. It was released on Blu-ray and DVD on September 6th, 2011.